Christmas is one of the most celebrated holidays in the world. Domini Games has released a hidden object puzzle adventure game where you can celebrate it in the land of Oz. The plot of The Christmas Spirit: Trouble in Oz Collector's Edition revolves around the most important part of the holiday - presents (as if there is anything else to think about during Christmas)! I don't know if you like helpers or not, but you get one in this game. You get an invitation to join the Christmas celebration and inauguration in the land of Oz. Clutch comes all the way to our world to tell you that. But his balloon was hit by a falling star (as it turns out a star falls every time someone leaves Oz to come into our world). Anyway, as you try to fix the ballon something sad happens. The Christmas presents are stolen by goblins! It looks like everyone is pretty upset about the stolen presents and the holiday spirit is gone. You are the one who can get the presents back and save the holiday. The Witch of the North is behind all the havoc and it calls for a real hero to fight her back (or invite her to the party?). I don't know if you like helpers or not, but you get one in this game. It is Toto (I guess he could be an exception for the fans of the characters). Toto comes in handy every once in a time but he also needs your attention quite often. 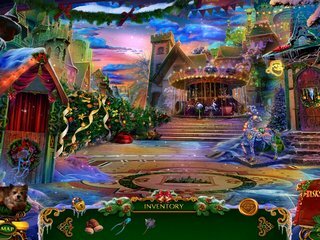 Even though the hidden object scenes don't offer anything new that you have not seen before they are fun to play and interact with. The puzzles are interesting and entertaining, too. They come in easy or hard versions. 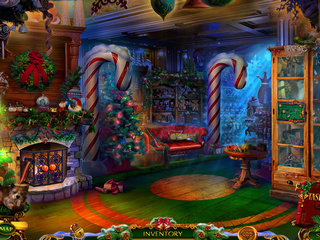 Both the HO scenes and the puzzles are Christma-themed, replayable, and get you in the mood during this season. There are emeralds to collect in every scene and use later in the bonus game. The bonus chapter takes a decent amount of time to complete, which is a special treat these days. There, because you did such a good job in the main game, you get to rescue Santa and Christmas. Among other collectibles to look for are firecrackers and book pages. There are 30 achievements to earn and a lot of media extras to enjoy after the game. 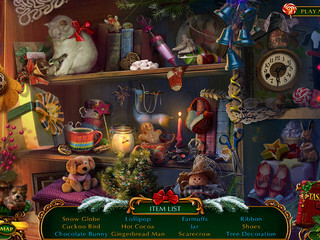 It is a fun and cute hidden object puzzle adventure game to enjoy this Christmas season. Check out the free trial version to decide if that's the kind of entertainment you enjoy! 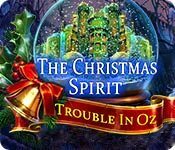 This is The Christmas Spirit: Trouble in Oz review. Download this game here.